I can’t believe it’s that time of year. To many other moms out there, this is exciting, much anticipated and welcomed with very open arms (hot coffee in hand). Why? Because I will miss having my little girl at home with me. I know, I know. Cut the apron strings and let her go. We attempted to send her off to JK last year, but that didn’t work out unfortunately because my son was born that same week and I was home alone (my husband had to be back at work right away) with a new baby, recovering from a cesarean and I also suffered from post-partum blues for 2 weeks post-pregnancy. It was rough. Therefore we decided that I would home school her for JK year which turned out perfectly because we have a large rec room which became the perfect and complete classroom to her and she learned a lot at home with “Teacher Mommy” for that year. She also socializes very well with close neighbor friends and cousins of the same age that she plays with often (thank goodness!). I do love routine, which is one reason I am actually quite longing forward to it and of course the fact that my little girl is bursting with thrill makes me happy for her too. I know she’s ready (she was ready last year!) and she can’t stop talking about it. I now have an active gig working from home and have gotten extremely busy with blogging projects outside of work so it will be a relief to me as well as I know I won’t have the time to home-school her as much during the day anymore. Well, it’s “Back-to-School” for our Ava and of course, I’m sending her off in Style! I recently became a new Sears Mom Back-2-School Brand Ambassador and was given the opportunity to shop with a $100 Gift Card (Thank you Sears and Mom Central!) to get our Back-to-School Shopping started. Initially I thought: Hmmm… how much can one really purchase with $100? I know it sounds like a lot but as a mother that shops for my children quite often, I know how pricey children’s clothing can be! That’s not including shoes, backpacks, etc. I shop at Sears a lot and I really love their separate Babies and Kids areas – The Baby Room and The Kids Room. Everything is so well laid out and it’s easy to find what you’re looking for. I needed to grab some essential wardrobe pieces for Ava and also a standard-sized backpack. 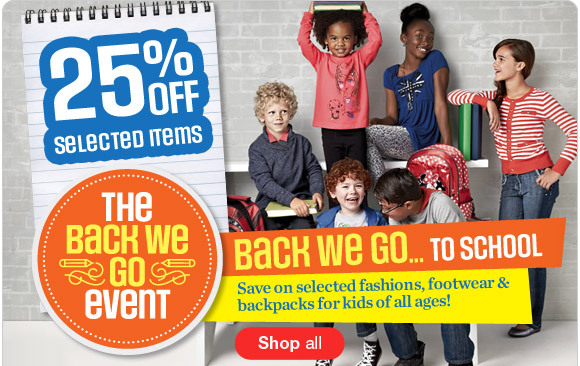 For their Back We Go Event, you can get 25% off selected items and I was also happy to see that their backpacks were on sale (with already low prices) plus with an additional 30% off! As tempted as I was to grab the Hello Kitty, I knew that I needed something different and that steered away from any characters. I wanted her to be able to use this for the next year if possible. Loved their selection. Whether you want a cute character like Hello Kitty, Disney Princess or Cars or a classic and reliable brand such as Roots, they have it! I was dying of cuteness overload in the clothing section. And was blown away at the pricing! Yes the chaos of back-to-school shopping has begun. Moms went crazy for this awesome deal! The mix and match clothing deals were an obvious steal and the prints on those shirts and pants were way too adorable and pretty. And they carry amazing brands such as Foxy Jeans™, HELLO KITTY™ , Levi’s®, Nevada®/MD, Converse® and more! With their Price Match Guarantee, you can rest assured you’re getting the best deal. And if that wasn’t awesome enough, did you know about KidVantage? KidVantage is Sears’ The Lifetime Wear Out Warranty that covers children’s apparel and footwear as long as a child in the family continues to wear the size. If the item wears out, Sears will, at its option, either repair it or replace it with the identical item in the same size, or if it’s unavailable, a similar item of equal value in the same size. It covers children’s apparel sizes from infants up to 18, and footwear up to senior kids’ size 6 . Amazing prices AND quality you can trust. This is what us Moms are looking for. And of course, I’m not sacrificing style here either. Smart and Stylish Buying. Now that’s something that’s always on trend! I was really happy with the items I was able to purchase for my daughter for less than $100 and cross off our Back-to-School Shopping List! 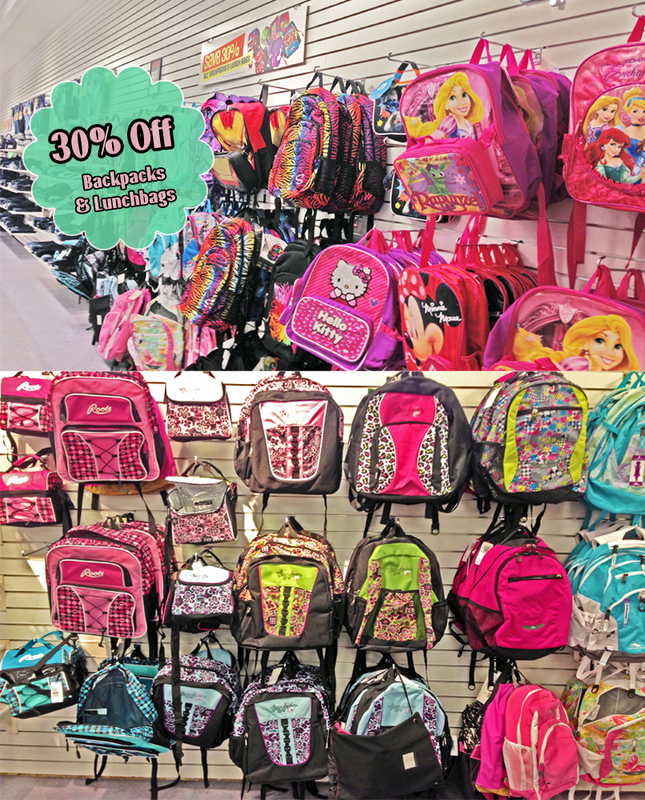 Have you completed your Back-to-School shopping yet? I highly recommend heading to your closest Sears for everything you need in one place and to save you money! If you’re on Facebook, make sure to ‘Like’ Sears Canada and Enter for a Chance to Win Sears’ “Back We Go” Facebook contest. Those are some cute finds, and I can’t believe it was only $100. Did your daughter love them? My family has shopped at Sears for a couple of generations now! We love the quality and the warranty! Love the items you selected – so pretty! It’s insane how much we can spend on back to school shopping so getting these great deals matter so much! We also love Sears! Didn’t know about Kidvantage – awesome! Thanks!